Designed as a rolling digital projector/notebook computer carry on case. It has semi-rigid, padded 1600 denier walls with six inline skate wheels (3per side) spaced 14.5" wide, a 41" extension handle, padded shoulder strap, #10 zippers, with a soft feel top carrying handle. 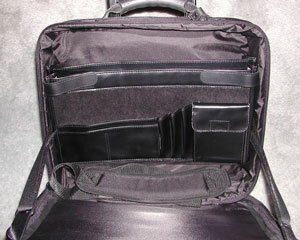 padded case with shoulder strap for side trips. portfolio, with possible room for a small digital projector, printer or camera.